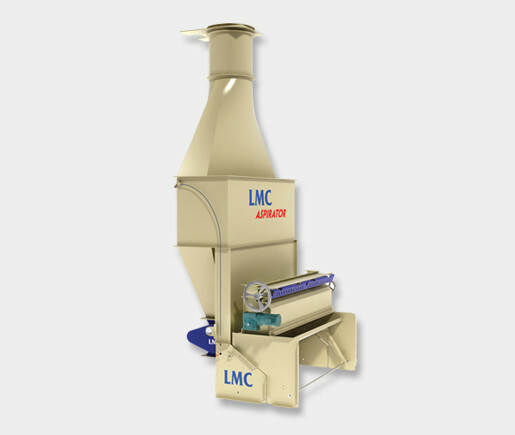 LMC Aspirators are designed for product separation by density and aerodynamic profile. We have multiple configurations available to provide optimum performance for your specific pre-cleaning or air-separation finishing needs. Applications for our industrial aspirators include agricultural products and recyclables. The aspirator has proven to be the most efficient aspirator available and is used in many different processing industries. It is designed to create a streamlined flow vacuum that is drawn throughout the product. As the air flow is evenly distributed, the separation is more easily controlled and more accurate. An absence of a controlled flow will result in leaving light material in the good product or, if operated aggressively, heavy, good product in the liftings. This design allows for product separation by density and aerodynamic profile. Multiple configurations are available to provide optimum performance and maximum flexibility. Its sturdy industrial caliber design will give years of around-the-clock service with minimum attention. Includes aspirator body with mounting brackets, flanged rectangle to round fitting, in-feed control gate, analog monitoring package with vernier airflow control. Includes aspirator body with mounting brackets, flanged rectangle to round fitting, vibratory feed pan or adjustable slide pan and unitary mount body, analog monitoring package with vernier airflow control. Includes aspirator body with mounting brackets, outfall tank, vibratory feed pan or adjustable slide pan and unitary mount body, analog monitoring package with vernier airflow control. The liftings enter an expansion chamber to allow the reject product to drop out of the air stream. The liftings are conveniently discharged for inspection and, if needed, adjustments to the air stream can be made. Includes aspirator body with mounting brackets, outfall tank with airlock, vibratory feed pan or adjustable slide pan and unitary mount body, analog monitoring package with vernier airflow control. Includes aspirator body with mounting brackets, outfall tank with auger, vibratory feed pan and unitary mount body, analog monitoring package with verneir airflow control. Used to set macro adjustments to the air flow. Used for micro control and adjustment to the air flow.